June and July 2013 full Moons are featured as “supermoons.” This means that the full Moon is almost on the same day as the Moon perigee (shortest distance to Earth). The difference between a supermoon and a normal full Moon is very hard to detect but it’s a great time to shoot the Moon. In this article I will explain how to shoot the Moon like an astrophotographer using your regular gear. Without a telescope you will get a sharp, crisp and big image of our beautiful satellite. Use your longest lens (200mm, 300mm, 400mm) and shoot the Moon from a good tripod. Focus manually carefully using live-view, use ISO2oo or 400 and shutter speeds like 1/250 or 1/320. Shoot many photos, 50 or 100, we will use these photos to increase our detail by stacking the photos like astrophotographers do. I’ve written a previous article with tips to shoot the Moon and you can read it before proceeding to the next step. After shooting you need to process the RAW files and convert them to 8 bit Tiffs (no need for 16 bits). Use your favorite RAW processor like Canon’s DPP, RAWTherapee, DXO Optics or any other. Play with contrast, highlights and shadows trying to get an even illumination on the Moon surface. That’s a very important step because as you have noticed the Moon has areas that are much brighter than others, we want to avoid areas that look overexposed while other areas look too dark. Balance the illumination as good as you can and then batch process all your photos together. Not a big winner uh? 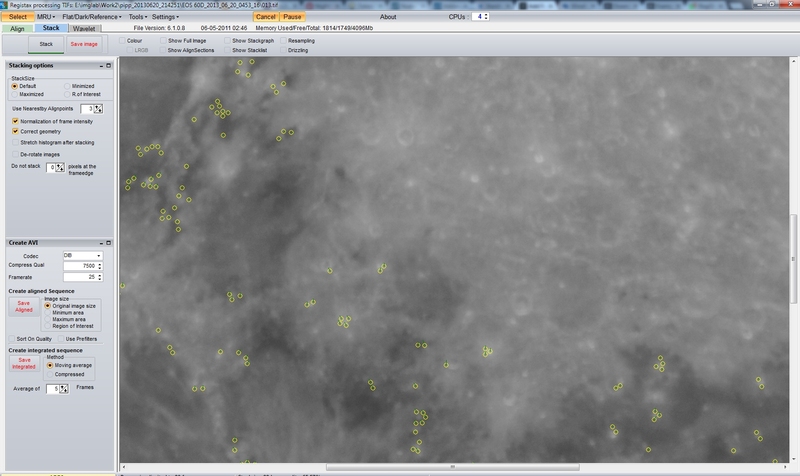 This is where we’ll use our bag of magic tricks to increase the detail and resolution of our Moon. 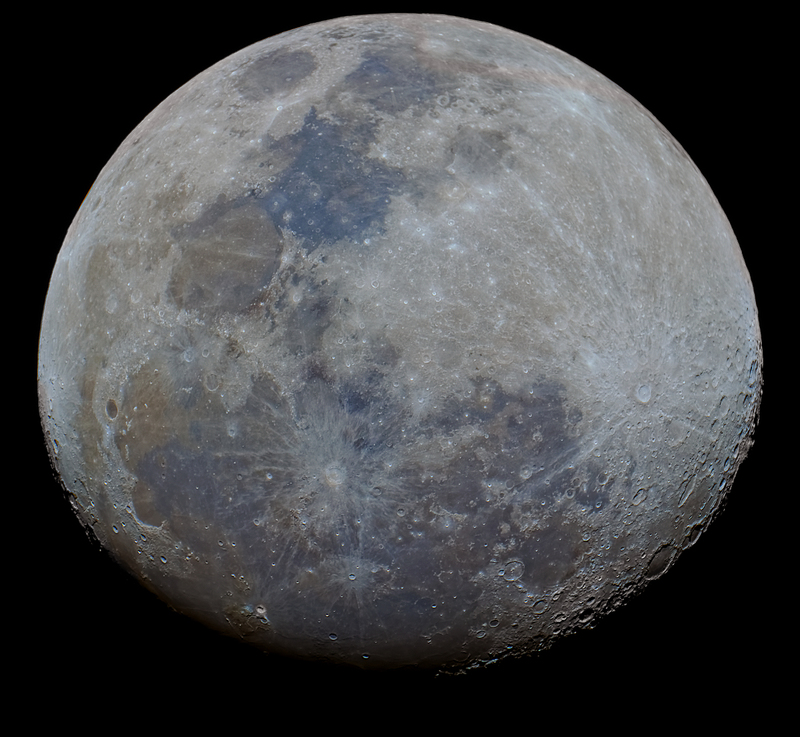 The first step is to remove all the empty black space around the Moon, if you are patient you can crop each file, if you are skillful you can use a tool to do that in batch mode and if you need a hand you can use PIPP, a very nice tool that will help you automate the centering and cropping of your files. 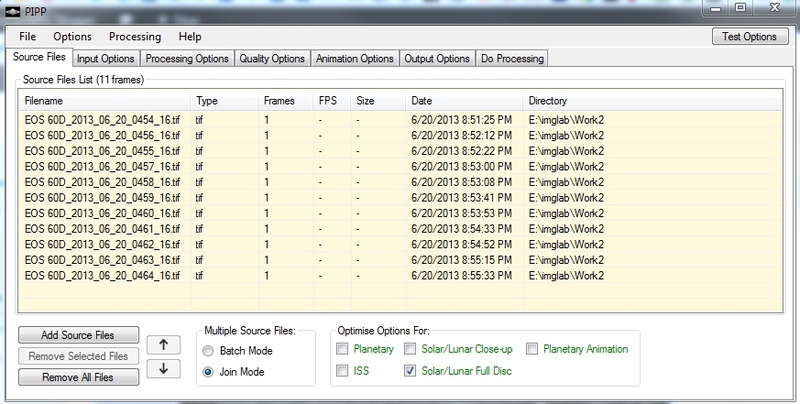 Follow this tutorial to learn how to use PIPP for lunar discs. Don’t even think about being scared because it’s really easy and you will have your cropped and centered tiff files ready in a folder in about 5 minutes. Don’t use PIPP to filter your photos by quality, because we’ll use another tool for that. Just crop and center. 2. In the Limit Setup area set the number of frames you want to stack, something like 80% of your frames is a good number, this will discard the worst 20% frames and only stack the good ones. In my case I shoot 110 frames and selected to stack the best 90 shots. 7. Go to the “Wavelets” tab and play with the sliders making sure you use “Do All” to see the effect on the complete photo. This is a very important step where you will be able to increase the detail of your photo in a big way. Open the stacked and processed photo and do whatever you want as final processing, touching contrast, curves, sharpness, etc. 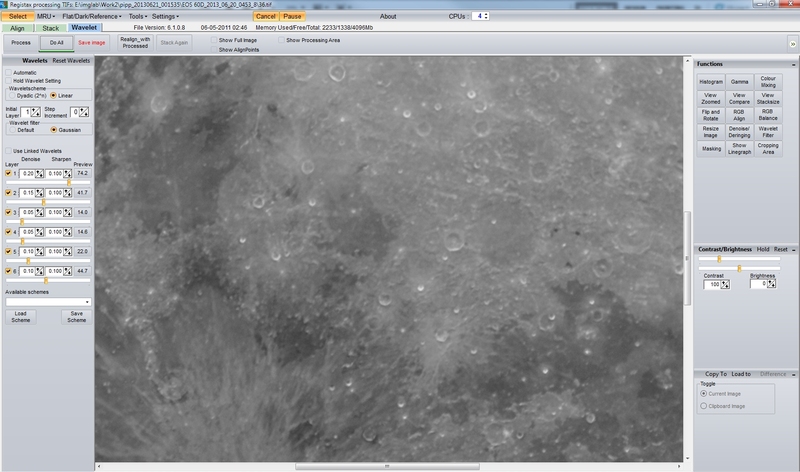 If you were careful with the wavelets step in Registax you will probably need no extra processing.At this point you might want to incrementally increase saturation to reveal the Moon colors as explained in this article. 11 Comments on "Shoot the Supermoon Like an Astrophotographer"
This is a great step-by-step guide. But I couldn’t help notice that all the tools listed are for Windows. Can you please provide some Mac alternative? Sorry Amit I’m not a Mac user, you might try emulating Windows under your MAC OS to use these programs. Fantastic step-by-step explanation! I tried it yesterday with just 30 images to start with, an I’m pretty surprised by the results. The stacking not only evens out the noise, but seems to actually increase sharpness. How is that possible? Dominik, great result! Congratulations. I’m happy the tutorial helped you. Your Moon shot is fantastic. Wow, fantastic shot! You’re essentially combining all the usable, n0n-noise information in the photo when you stack. This helps get rid of the uneven noise across all the photos you’re stacking as well as sharpening the picture because most of the good stuff matches. Hope that makes sense. 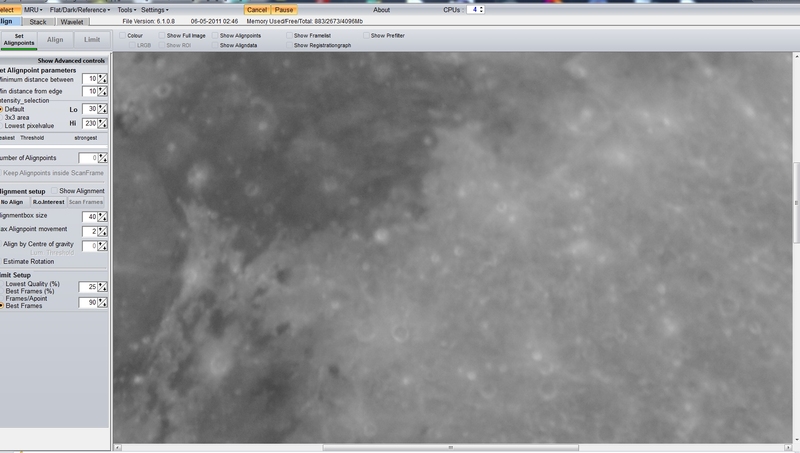 Hey, i started doing it, and i stopped at Registax steps. When i select photos in Registax and “import” them, nothing changes, i don’t even get my picture in program, screen remains blank white and if I try to set alignpoints nothing changes. Please help! I guess something is wrong in settings. Make sure you select TIFF as file type to import in Registax and make sure you used PIPP to reduce the file size first. Depending on your setup this might take a while I suggest you to start with say 5 photos, if it works, try 10, then 20, and find the limit for your computer and file sizes. Using PIPP is really important because if you feed 16 bit Tiff files without cropping to Registax it just explodes it can’t handle such huge files. By chance, is there way to do most of these steps in photoshop? Really stunning results. 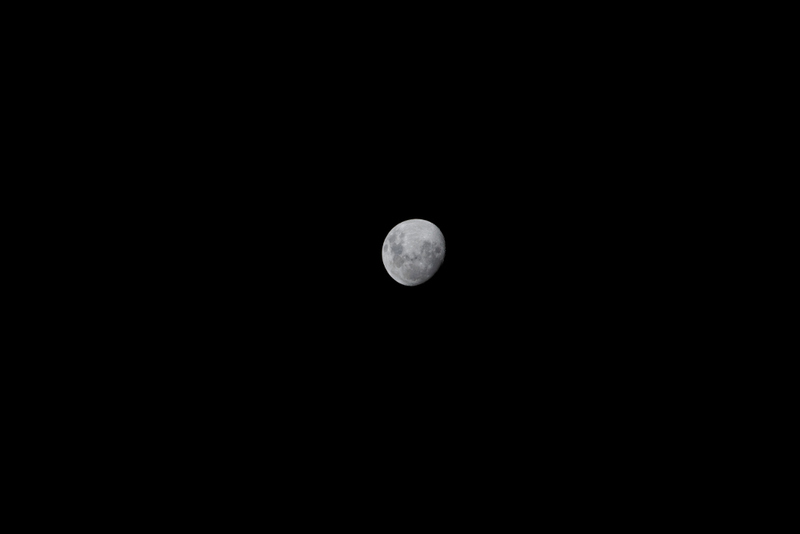 I tried shooting the moon a few weeks ago, and my results left much to be desired. Thanks for the tips, maybe the next round will turn out better!